We have recently had a few enquiries from new users to Apple iPhones & iPads that they are having issues downloading programs, please note that you would need a "download & media player" program to download titles directly to your device as Apple devices will not allow you to just download and play files (this is an Apple issue rather than download issue). These programs can be found on the App Store. Finally (after a bit of blood, sweat and tears :-) ), the third of Glyn's recordings from the early 1990's has been edited and lovingly restored and is available once more as an download. 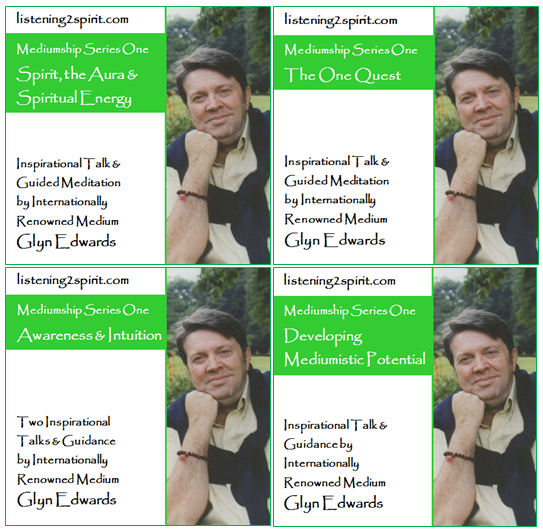 On this recording, Glyn gives inspiration and advice on the positive attitude we need for unfoldment and takes you through four guided meditations/exercises to enhance your attune to self and spirit. Finally, the second of Glyn's recordings from the early 1990's has been edited and lovingly restored and is available once more as an download. On this recording, Glyn gives inspiration and advice on the mental processes of undfoldment and guides you through a meditation for attunement and blending with spirit. Finally, the first of Glyn's recordings from the early 1990's has been edited and lovingly restored and is available once more as an download. 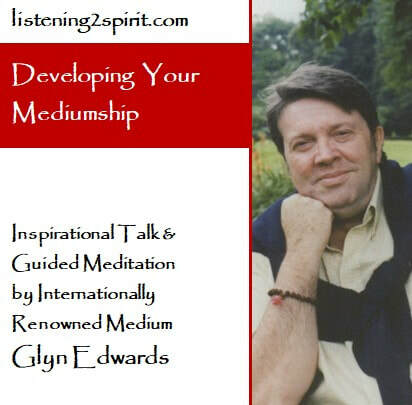 Glyn Edwards Mediumship Series 1 - Original released on audio tape in the early 1990's (on audio cassette), these four titles contain inspirational talks, invaluable guidance and meditation practices on aspects many of mediumship. We launched our website on 9th August 2016, starting off with four titles by Glyn Edwards, our aim will be to expand the range of titles over the coming months. Many thanks to everyone who entered our website launch competition and have been liking, sharing and supporting our Facebook page and website. Our First Prize Winner was Chris Ramsay, who won all 4 titles by medium Glyn Edwards for FREE. Our five Runners Up who won a FREE download of their choice were Trevor Baldwin, Charlie Reilly, Cynthia Twynham, Mandy Smyth and Martina Joklikova-Roe.